The #5 ranked University of New Brunswick Varsity Reds scored two goals in 17 seconds in the 2nd period, and continued the strong defensive play they exhibited all weekend, to defeat the #3 ranked St. FX X-Men 3-1 to capture their 6th University Cup in school history tonight in Halifax. Once again, the V-Reds got out to a quick start as they out-shot St. FX 10-2 in the early going. They got on the board at 6:53 when Jordan Murray fired a point shot wide of the net intentionally, or it was deflected wide. Regardless, Christopher Clapperton picked the puck up off the end boards and wrapped it around the far post before goaltender Drew Owsley could get across the crease. Cam Braes picked up the other assist on the goal. A couple of UNB penalties in the latter half of the period gave the X-Men some momentum and they started to even up the play. AUS MVP Eric Locke came close to tying the game when a rebound came directly to him as he was all alone at the side of the net. However, Etienne Marcoux made arguably his best save of the tournament when he slid across and snapped out his left leg to just get enough of the puck to keep it out. The X-Men would find the equalizer late in the period. After a UNB icing, St. FX won the ensuing offensive zone face-off and Zack MacQueen tipped Nathan Chiarlitti's shot from the blue line off the post and in with just 11 seconds remaining in the period, sending the huge pro-St. FX crowd into a frenzy. Shots ended up 14-10 for UNB. With the crowd back into it after the late goal it seemed as if the Varsity Reds might be on the ropes, but instead they locked things down and played almost flawless hockey over the final two periods. 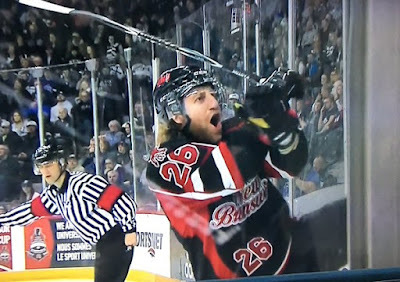 UNB failed to capitalize on their first power play opportunity of the 2nd period, but they were given another chance just minutes later and this time Francis Beauvillier made it count. Beauvillier (Gazzola, Halley) rushed the puck into the offensive zone and snapped a shot on goal that Owsley kicked out. Beauvillier kept charging toward the net, got around the defender, and quickly fired his own rebound in to give the V-Reds a two goal lead at 9:02. On their very next shift UNB would strike again. Tyler Carroll (Willick, Boudens) picked up a loose puck during a scramble around the crease and stuffed it in, and just like that the V-Reds went from a tie game to a 3-1 lead in a matter of 17 seconds, quieting the crowd in the process. After the goal Carroll kindly acknowledged all of the X-Men fans in the stands (pictured above). Both teams would trade power play chances the rest of the period, but to no avail. Shots in the period were 11-6 for UNB. With only twenty minutes separating the Varsity Reds from another National Championship, UNB played a smart, conservative, defensive-first final period that limited the X-Men to just 7 shots on goal and not much in the way of quality chances. St. FX killed off a penalty with less than 5 minutes remaining and although they pulled Owsley with two minutes remaining, they were only able to generate one or two decent chances. UNB was able to run out the clock to claim their 5th University Cup in the last ten years. - Shots in the game were 30-23 for UNB. After some shaky defensive games earlier this season, the Varsity Reds clamped down and only surrendered 51 shots - and two goals - in their three games this weekend. - UNB dressed the same line-up tonight as they did in the other two games. Peter Trainor, Chris Caissy, Mike Thomas, and Stephen Anderson were all scratched. - The V-Reds were 1 for 4 on the power play while St. FX was 0 for 4. UNB successfully killed off all 13 shorthanded situations they faced this weekend, which was another major key to their success. - UNB won 42 out of the 83 face-offs in the game. All of the usual suspects - Taylor MacDougall (7 out of 11), Cam Braes (13 out of 21), and Dylan Willick (12 out of 21) - had strong games at the face-off circle. - Attendance for the game was 9873. This brought the total attendance for the tournament to a record 43 515. - UNB improves to 6-5 all-time in National Championship games. - 5th year seniors Taylor MacDougall and Tyler Carroll will finish their UNB careers with 2 National Championships, 1 Silver Medal, and 4 University Cup appearances in their five seasons. They were also a part of 3 AUS Championships and 5 AUS regular season titles. - Clapperton and Eric Locke were named the players of the game. - UNB held a lead for 151:37 of the 180 minutes they played in the tournament, and never trailed. - This is the first time UNB has won the University Cup while wearing their dark jerseys. - It is also the first time they have won the University Cup out of the afternoon pool since 2007. In 2009, 2011, 2013 they played in the evening draw. - UNB won as a #5 seed, tied with the 2007 team as the lowest seed to ever win the tournament. - Philippe Halley was named the tournament MVP (to the shock of absolutely no one) after scoring 6 goals and adding an assist in the three games. - Halley joins Tyler Carroll (2013), Luke Gallant (2011), Lachlan MacIntosh (2009), and Chris Zanutto (1998) as V-Reds who have won tournament MVP. - Joining Halley on the all-tournament team are goaltender Jordon Cooke (Saskwatchewan), defencemen Jordan Murray (UNB) and Nathan Chiarlitti (St. FX), and forwards Michael Clarke (St. FX) and Anthony Repaci (Saint Mary's).